Vegan Tempeh Reubens: Gluten-Free, Rich and Creamy Without Meat or Dairy! Summary: Sometimes vegans get a craving for a hearty meal. Many of us grew up eating meat and dairy products, but later ditched them due to health, philosophical and/or humanitarian reasons. Still, we often miss familiar comfort foods, and long for the taste of….well, not meat, exactly, but something equally filling. Reubens are one of those comfort foods that went by the wayside when we gave up a carnivorous diet—until now. Sometimes vegans get a craving for a hearty meal. Many of us grew up eating meat and dairy products, but later ditched them due to health, philosophical and/or humanitarian reasons. Still, we often miss familiar comfort foods, and long for the taste of….well, not meat, exactly, but something equally filling. Reubens are one of those comfort foods that went by the wayside when we gave up a carnivorous diet — until now. 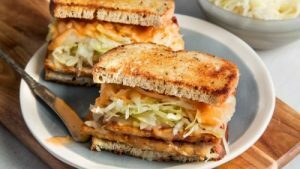 When you bite into one of these vegan, gluten-free tempeh reubens, you will be astonished. Robust flavor without the greasy aftertaste or the guilt! Tempeh is protein-rich and packed with vitamins, and sauerkraut is great for digestion. This dish is healthy, simple to make, inexpensive, and delicious. Combine marinade ingredients in a deep dish and cut tempeh in half, then slice lengthwise to make four pieces. Soak tempeh for 20-30 minutes until well-seasoned. Fry slices in olive oil on stovetop until brown on both sides. Pour leftover marinade over the top while cooking and allow it to simmer until absorbed. Remove tempeh from pan and set aside. Combine ingredients in small bowl for Russian dressing. Fry rye bread in pan on both sides until lightly browned. Remove from pan and spread all four slices with a generous layer of Russian dressing. Pile on tempeh, cheese slices, and a dollop or two of sauerkraut. Put slices together to create two sandwiches and return them to the frying pan. Adjust stovetop to medium heat seating. Fry sandwiches on both sides until bread is dark brown and cheese is melted. This should take no more than five minutes. Remove sandwiches from pan, pile them on a plate, and dig in! Serves 2 hungry people, but you can increase the amount of ingredients for a larger party. This meal pairs well with gluten-free, dark beer or red wine (check www.barnivore.com to make sure your alcoholic beverages are vegan). You’ll want to make this tasty dish again and again! Enjoy! Vegan tempeh reubens are terrific! Healthy, satisfying, inexpensive, and easy to make! You'll love this high-protein, calcium-rich dish, packed to overflowing with fresh sauerkraut and homemade vegan Russian dressing.